Extending 22 miles, the Spessard L. Holland East-West Expressway is an integral freeway across the greater Orlando metro area. Constructed from 1967 to 1971, the Holland East-West Expressway opened first as a bypass for SR 50 (Colonial Drive) through central Orlando. It originally ran from a point west of SR 435 (Kirkman Road) to SR 50 west of Union Park (where SR 417 now meets Colonial Drive). The Western Extension opened on October 8, 1990. This included a spur northwest to SR 50 (West Colonial Drive) by West Oaks Mall, and a partial connection with Florida&apos;s Turnpike at Gotha.2 Construction of a full interchange between the East-West Expressway and Florida&apos;s Turnpike was completed in August 2006. 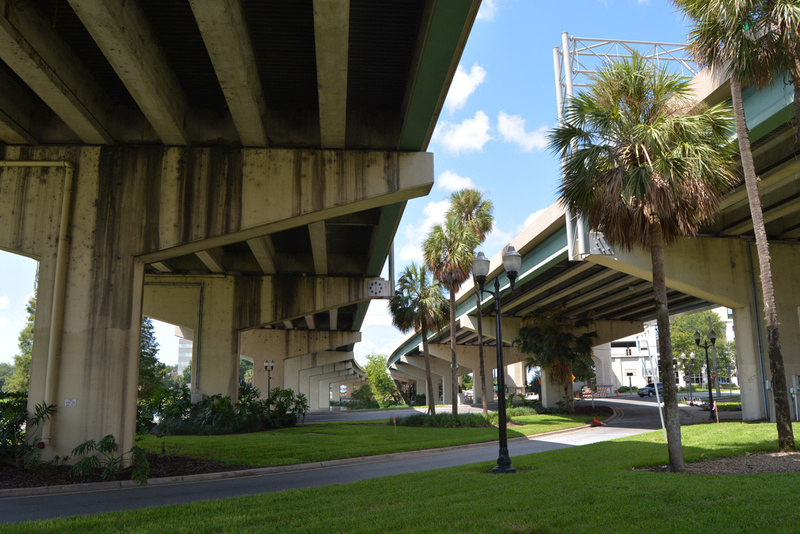 Much of the East-West Expressway has an urban feel, as the freeway passes through dense built-up areas within Orlando city limits. Increases in traffic due in part to the aggressive growth of greater Orlando area necessitated expansion and modernization of the 1970s roadway. The addition of high speed toll lanes, capacity increases, and new highway lighting were parts of an overall widening program undertaken along SR 408 between 2003 and 2013. Prior to January 2013, State Road 4080 was the short connector joining SR 408 (East-West Expressway) east with SR 417 (Central Florida GreeneWay) north and SR 417 south to SR 408 west near Union Park. A diamond interchange (Exit 1) joined the connector with Valencia College Lane, a local east-west arterial between SR 551 (Goldenrod Road) and Econlockhatchee Trail. SR 4080 also represented the easternmost leg of the original East-West Expressway. As part of the SR 408 / 417 interchange improvements, the wye interchanges with the SR 4080 connector were removed, and the freeway was demolished north of Valencia College Lane. The remainder of the road south was converted into a surface arterial and realigned to end at Chickasaw Trail. Good Homes Road stems north from Old Winter Garden Road (CR 526) to a parclo interchange (Exit 2) with the East-West Expressway. Photos taken 04/26/15. Good Homes Road links eastern reaches of Ocoee and west Pine Hills with the East-West Expressway at Lakeview Heights. The arterial formerly bottlenecked between SR 50 (Colonial Drive) and the westbound ramps with SR 408. Photo taken 01/14/08. Second photo taken 12/04/10. Third photo taken 01/18/10. The eastbound on-ramp from Good Homes Road was realigned to accommodate 2006-07 construction of the loop ramp from SR 408 east. Photo taken 02/17/08. Interstate 4 and Florida 408 trailblazers posted on Michigan Avenue eastbound at Orange Blossom Trail (U.S. 17-92-441). Before Florida 408 was signed, the East-West Expressway was an unnumbered route signed with trailblazers featuring an orange. Photo taken 01/13/04. Aesthetic features of the Florida 408 reconstruction and expansion project included landscaping, new light fixtures, stepped sound barrier walls, and decorative panels and post caps, such as those at Orange Blossom Trail. Photos taken 11/05/06. A typical ramp toll booth configuration at the U.S. 17-92-441 (Orange Blossom Trail) eastbound on-ramp to Florida 408. Photo taken 11/05/06. 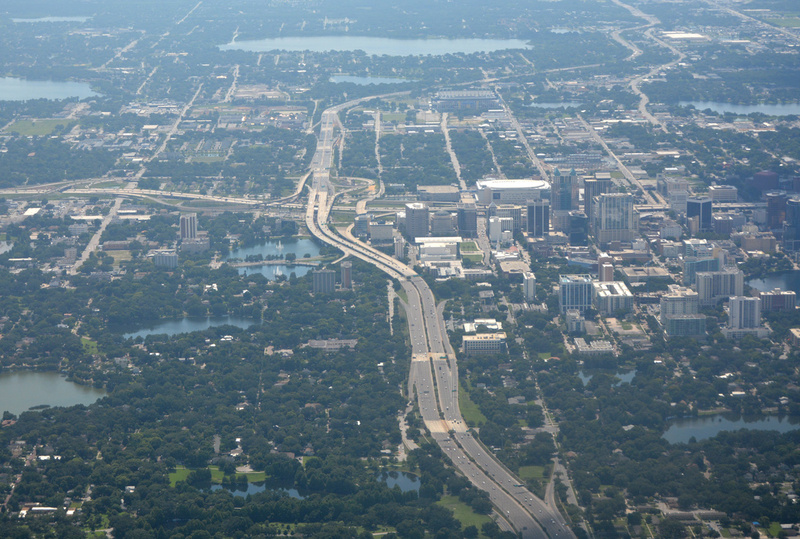 Anderson Street runs along the south side of SR 408 from Rosalind Avenue, south of Downtown Orlando, to Lake Underhill. Ramps join the East-West Expressway with Anderson Street at Mills Avenue (SR 15). Anderson Street carries SR 15 southbound to Lake Underhill Road while South Street along the north side of SR 408 doubles SR 15 northbound. Photo taken 12/29/05. The westbound SR 408 trailblazer at Anderson Street and SR 15 was removed following the permanently closure of the westbound on-ramp from Mills Avenue. Photo taken 12/29/05. South Street (Florida 15 north) at the Bumby Avenue on-ramp to Florida 408 westbound. Florida 15 north remains on South Street west to Mills Avenue north; South Street continues along the East-West Expressway to Rosalind Avenue. Photo taken 12/29/05. "Beltway Leg Named for Man Who Paved the Way." The Orlando Sentinel (FL), May 11, 1989. Shofner, Dr. Jerrell H. History of the Orlando-Orange County Expressway Authority. Orlando-Orange County Expressway Authority, 2001. Print.